Our time in Kyoto was short, but in truth, felt appropriate. There's a lot to see here (the requisite shrines and temples mainly), but it was the quiet moments, like a rare Geisha sighting late at night and a frozen in time coffee shop run by an spry 80 year old man with an impressive collection of vintage radios that made Kyoto memorable for me. These experiences made me remember why it is I love to travel and why every destination deserves a closer look. Villa Aneyakoji was a lovely, modern ryokan experience. The service here was top notch. Tip: The penthouse was a great value; it's a twin room, but there's a huge terrace overlooking the city. They'll deliver breakfast to your terrace upon request, though for the price you can definitely find a better meal. The Ritz Carlton Kyoto is brand new (built in 2014) and has a killer, riverside location. The service was outstanding (the concierge helped us book an incredible, last minute dinner reservation) and the common spaces were beautifully designed. Our room didn't have a river view, but was nonetheless excellent (hello teak shower!!). Don't miss breakfast, complete with Pierre Herme pastries (I had 4). Tip: Book a massage. The spa experience here is truly wonderful. Kinkauji, also known as the Golden Temple, is arguably one of the most popular Kyoto attractions. Expect crowds. The temple itself is beautiful, gold and glittery. Bonus: there's a tea garden here selling snacks and drinks. 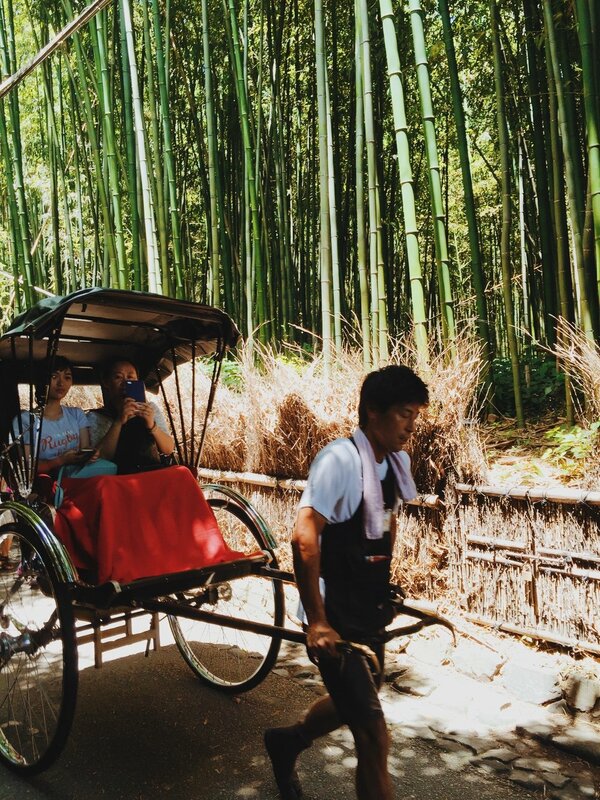 The Bamboo Forest is a lovely and tranquil spot, despite the crowds of people. Go early (around 7AM) if you want to have a moment of actual zen. The Tenryu-ji Temple is accessible from the Bamboo forest and is worth a visit if you're in the area. The Philosopher's Walk is a peaceful way to see Kyoto. The path is lined with cute shops, restaurants and cafes making this an enjoyable place for a mid-afternoon stroll. Though most places on the river look inviting, they're mainly tourist spots catering to Western tastes. If you want something a bit more authentic, you'll have to wander off the main drag. The Gion District has a handful of restaurants and bars that feel much more authentically Japanese. Gion Niti is top of my list for atmosphere, service and food. Tucked away on a side street and impossible to find, the bar is decorated in gilded rice paper and is absolutely stunning. The drinks here are expertly mixed and are well worth the bar charge. The menu has a wide range of options (delicious Kobe beef starter), but you'd be silly not to order the pizza. Yes, I know, pizza in Japan. But this was truly some of the best I've ever had...and I've had a lot (in Italy and beyond!). Excellent wines by the glass, no easy feat in Japan, and range of Japanese whiskeys. Bar K6 was the perfect place to kick off our evening. The bartenders sport tuxedos and take their drinks very seriously, though the decor might suggest otherwise. Cave de K downstairs is a must for any whiskey lover. 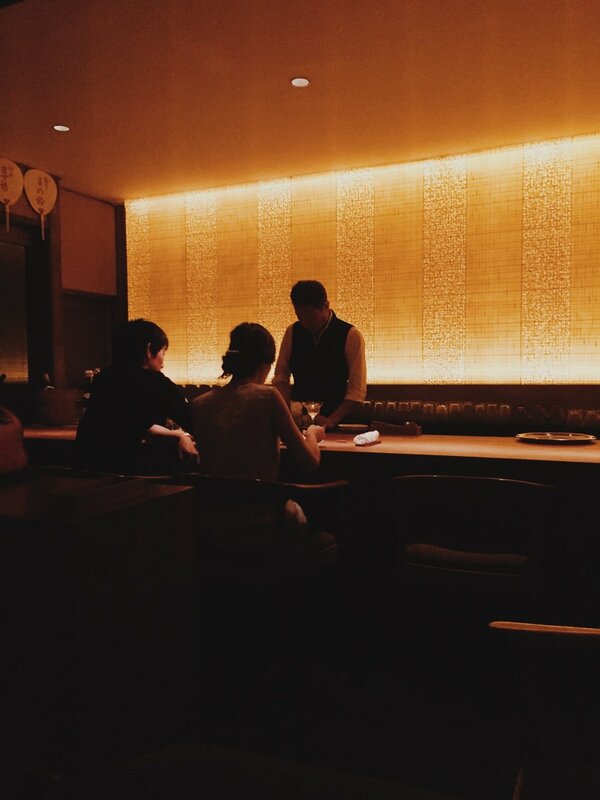 Jiki Miyazawa is a traditional kappō dining experience (when diners line up in a row facing the chef) and one that will leave you breathless. Our meal was fantastic and the chef is certainly deserving of his Michelin star. The star of the show is a lovely piece of broiled sesame tofu that bursts open like a savory creme brûlée. A perfect kaiseki experience. Reservations are essential. Kyoto is known for tofu, and there's no better place to sample it then Tofu Cuisine Matsugae. Popular with locals, this spot is a bit under the radar and can be hard to find. Solider on. The green tea and soba flavored tofu make it worth it. Set lunch menu available. Yamamoto Menzo is famous for udon, with a queue to prove it. If the line is shorter at Okakita (literally right next door), go there. They're both excellent. Resign yourself to the fact that seeing EVERY. SINGLE. SHRINE. might not be 100% realistic. Kyoto is far more spread out than I anticipated, and we had to whittle our list down significantly. Most shrines and temples are at least 40 minutes from the city center. Public transportation (trains and buses) is available, but given our limited time, we opted to take taxis. Looking back, we probably should have hired a guide/driver (something we rarely do). If time is an issue, I'd consider this as an option. Kyoto is famous for Geisha, though there are a lot of fakes walking around. If you want to spot a real one, it will require patience. We got very lucky and were literally in the right place at the right time. No matter what, if you do see one, be respectful. This is a time honored tradition and not a tourist attraction. In truth, we probably picked the worst time to visit Kyoto (late summer) when the weather made it nearly impossible to enjoy all of the outdoor attractions. If you can, come during Spring or Fall when the cherry blossoms and autumn colors make Kyoto come alive. I touched on this in my Tokyo notes, but unless you are planning to do a fair bit of touring around Japan, I'm not totally sure the JR Pass makes sense. Getting it was a bit of a headache, and requires a voucher exchange at the ticket office before you can actually use it. If Kyoto is your only destination outside of Japan, you might be better off purchasing tickets while in Japan.